We believe that God calls us to reach out to people in need. We hear about the love of God on Sunday mornings, and then go out to practice that love during the week, by caring for others as God cares for us. We house an Access Food Bank every Wednesday. At the Food Bank persons who meet the eligibility criteria are allowed to shop for food to assist in feeding them and their family. The Food Bank opens its doors at 1:30 pm. How can I help? There are essentially two shifts for volunteers, one in the morning to set out the food, and one in the afternoon to help clients. Many of our volunteers work both shifts. From nine to noon every Monday through Thursday we give out free bag lunches for anyone who asks. The lunches are packed after our 8:30 service on Sunday mornings, and volunteers hand them out during the week. How can I help? Most shifts are filled, but we need back up volunteers to help hand out lunches from nine to noon, Mondays through Thursdays. If you come to the 8:30 service, you can help pack the lunches. This program is for all youth from kindergarten through high school. The families do not need to be members for the youth to participate. 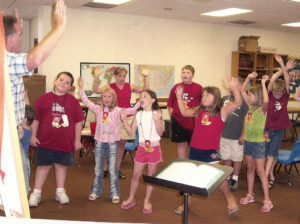 The program follows the school year beginning in September and continuing through May. Each Wednesday evening beginning at 4:30 pm the youth gather for snacks, games and Bible learning At about 6 pm a dinner is served family style. This is followed by a craft period with the evening’s activities being over by 7:30 pm. To register your child for this program contact the church office by clicking here. We provide our facilities to non-profit organizations at little or no cost when available. Some groups and activities that have used our facilities are The Southern Oregon Music Festival, Rogue Valley Harmonizers, the Family Nurturing Center, The Kelly Shelter’s Day Center, and the YMCA. If you would like to support this church or the special missions of this church with a financial gift, you may do so by clicking on the donation tab and following the directions. We thank you for your generous donations. If you feel called to volunteer or would like more information on volunteering to serve in one of our missions, please contact Elizbeth in the church office at 541 779-1711, Ext. 200 or send her an email at FPCM@firstpresmedford.org. We participate in 4 national offerings collected for the Presbyterian Church USA. These offerings are: (1) One Great Hour of Sharing; (2) Pentecost; (3) Peace and Global Witness; (4) Christmas Joy. A gift to the Pentecost Offering helps the church encourage, develop, and support its young people, and also address the needs of at-risk children. 40% of the Pentecost offering can be retained by individual congregations wanting to make an impact in the lives of young people within their own community. The remaining 60% is used to support ministries of the Presbyterian Mission Agency to support Young Adult Volunteers, ministries for youth and for children at risk. A gift to the Peace & Global Witness Offering enables the church to promote the Peace of Christ by addressing systems of injustice across the world. Individual congregations are encouraged to utilize up to 25% of this Offering to connect with the global witness of Christ’s peace. Mid councils retain an additional 25% for ministries of peace and reconciliation. The remaining 50% is used by the Presbyterian Mission Agency to advocate for peace and justice in cultures of violence, including our own, through collaborative projects of education and Christian witness. Each year during the Advent and Christmas season, we turn our eyes to Bethlehem and celebrate the wondrous gift of Jesus Christ, our Savior. By giving to the Christmas Joy Offering, you honor this gift by providing assistance to current and retired church workers in their time of need and developing our future leaders at Presbyterian-related racial ethnic schools and colleges.